Opinions differ as to the naming of vegetables Courgette and Zucchini. The fruits of plants have different titles in different countries in which they are grown. 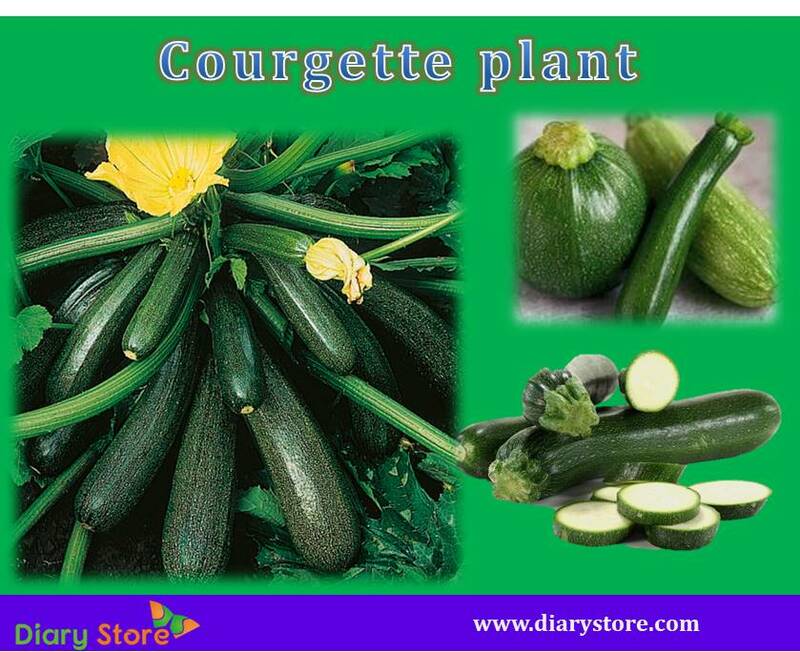 The vegetable fruit is known by the name Courgette in Britain, New Zealand and South Africa; and its French title Zucchini is widely used in North American continent, Sweden, Germany and Australia. According to some, the fruit of the same plant in different stages of development are known by different names. The immature fruit before attaining the length of 14 centimeters is called Courgette and when its length extends farther, the fruit is referred to as Zucchini. Since the fruit is of the same plant, the names Courgette and Zucchini have become interchangeable. Whatever be the stage of development, the plant has been included in the group Cucurbita pepo, a broad term that covers other squashes and pumpkins. By practice, the immature fruits are harvested for culinary purposes because the aged fruits tend to become bitter in taste and also get mashed up during cooking. Female flowers grow from the apex tip of Zucchini fruit whereas the male flowers sprout at the junction of petiole and the stem of the plant. Both flowers are edible and used in cooking. The fruits of zucchini when fully grown can reach length of a meter. However, the younger fruits of upto 20 cm length are preferred for culinary purposes on account of their mild acceptable taste and tenderness. Immature zucchini fruits are slightly sweet in flavour and fit for being used in cooking. Zucchini can be cooked by different methods like boiling, steaming, grilling and deep frying. It can also be eaten raw but it is sometimes slightly cooked in hot salads while preparing Thai and Vietnamese recipes. In addition, very thin thread-like strands are flayed off from the deep flesh of Zucchini fruit to prepare helical shaped noodles. Another variant of culinary item is zucchini stuffed with tomatoes and onions to give a different taste to the palate. *Relative values of percentage have been given vis-à-vis a diet of 2000 calories. 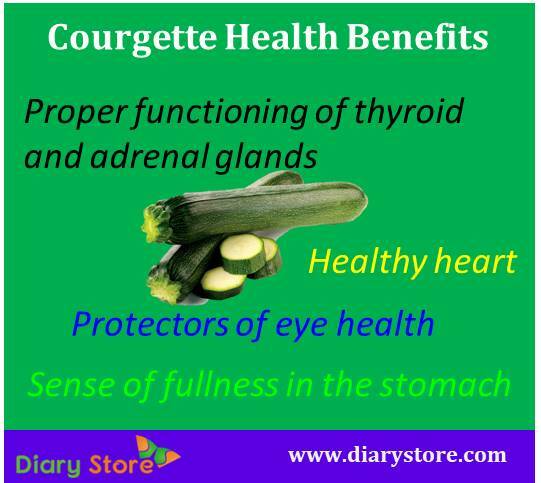 Plenty of fiber content in zucchini gives a sense of fullness in the stomach soon after it is consumed and thus dissuades excessive intake of carbohydrates which may hike blood sugar levels. Proper circulation of blood is ensured by the higher fiber content and lower content of sodium and sodium in zucchini. Good circulatory system is essential for healthy heart. Antioxidants and phytonutrients of zucchini like vitamin C, beta-carotene, manganese, zeaxanthin and lutein are efficient fighters against free radicals and protectors of eye health. Folate, riboflavin and vitamin B 6 give notable support in brain functions and are vital for metabolism of carbohydrates and proteins in human body. Zucchini is greatly useful in curtailing overweight and obesity due to abundance of water and fiber as well as appreciably low calorie content. When peels of zucchini are consumed regularly in prescribed quantities, the polyphenols and vitamin C present in them are found to support proper functioning of thyroid and adrenal glands. Peels of zucchini are also found to consist of antioxidants which can strengthen immunity and prevent diseases arising from inflammation.